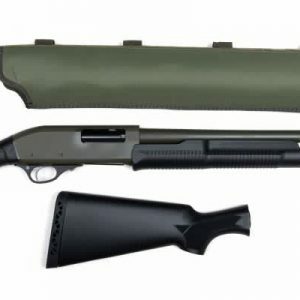 The Axor MF-2 Shotgun is a semi-automatic 12 gauge shotgun, that is chambered in 3″. It has a detachable polymer carry handle with adjustable front and rear sights. The chasis is full aluminum and features a full length top picatinny rail which is perfect for adding red dot sights or a scope. The MF-2 features an adjustable stock that also has an adjustable cheek riser as well. Kit includes: Take down case, breacher choke, full choke, 3 magazines (1/5, 2/10) pinned to 5 round.